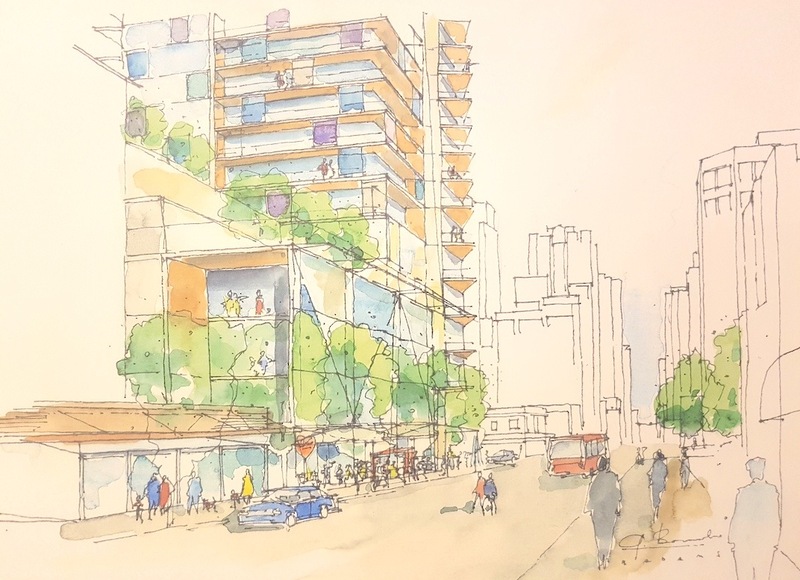 The community garden on the former gas station site at the northwest corner of the intersection of Burrard Street and Davie Street in downtown Vancouver was never meant to last forever. 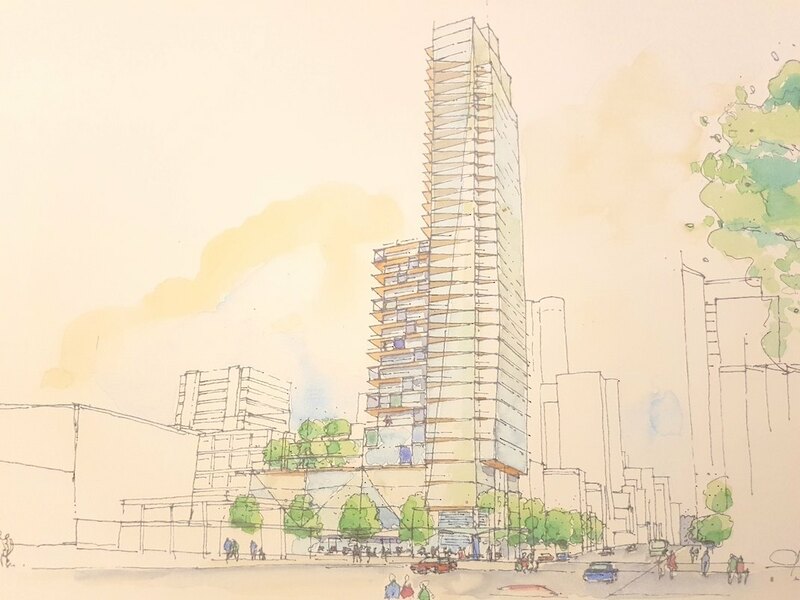 Local developer Prima Properties is proposing to redevelop its 21,600-sq-ft property at 1157 Burrrard Street with a 425-ft-tall, 43-storey, triangular-shaped tower that sits on top of a podium. Designed by Merrick Architecture, there will be 271 homes, with the unit mix roughly split 50-50 between studio or one-bedroom units and two-bedroom units. Additionally, about 11,900 sq. ft. of commercial space is planned for the lower floors, including 8,600 sq. ft. of ground-floor retail space. Six underground levels will hold approximately 230 vehicle parking spaces and 360 bike parking spaces. 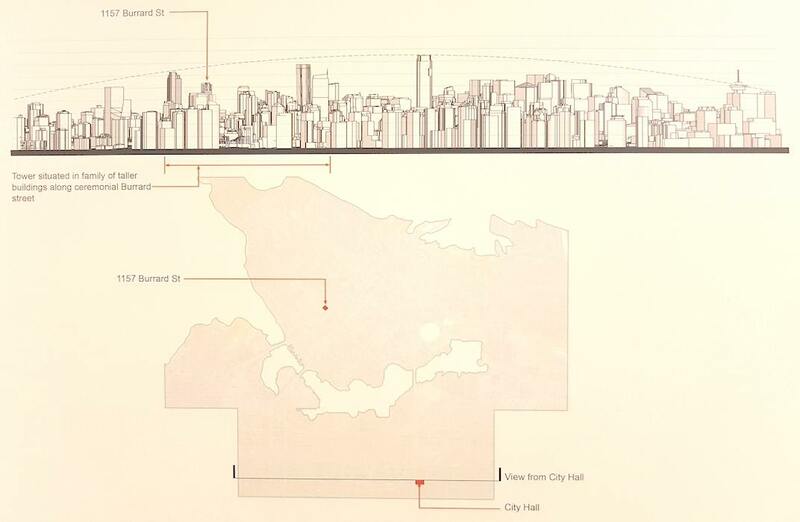 A building density of 13.41 times the size of its lot is envisioned. 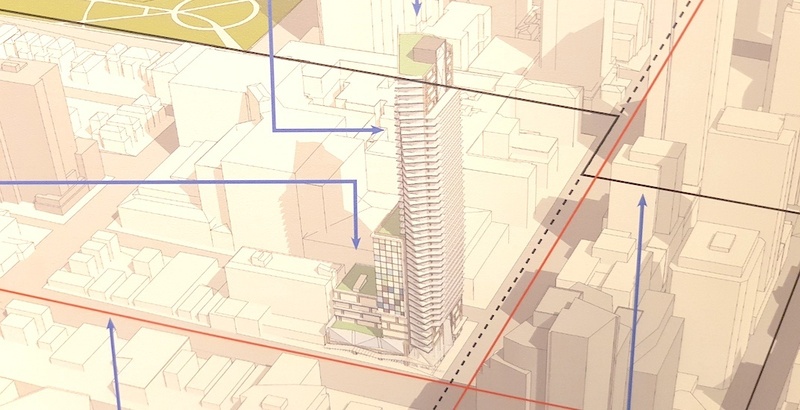 The proponents are aiming for a LEED Gold environmental design, and this will be substantially achieved by an ever-moving system of sun shades on the tower’s western facade. “Because the building is mostly oriented towards the west, we were concerned about the solar gain on the west of the facade. 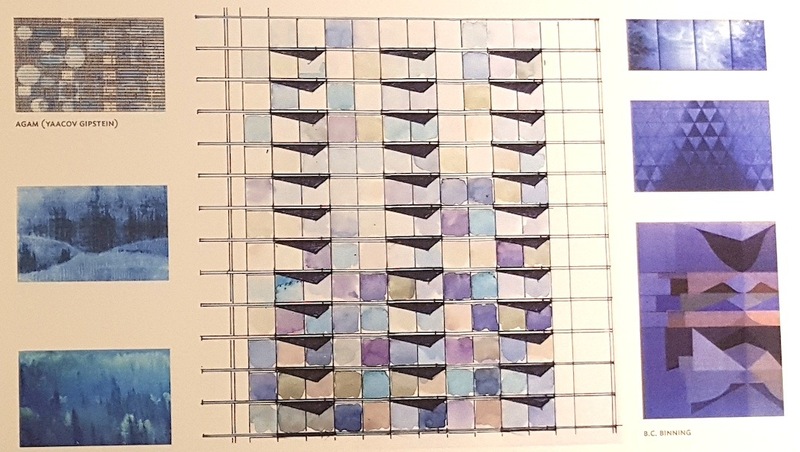 So we are looking to introduce solar blinds that go up and down, in a way that the west facade will always be changing depending on the angle of the sun,” Gregory Borowski, the principal of Merrick Architecture, told Daily Hive. These sun shades also serve a dual purpose, as its multicoloured pattern reflects the natural landscape. 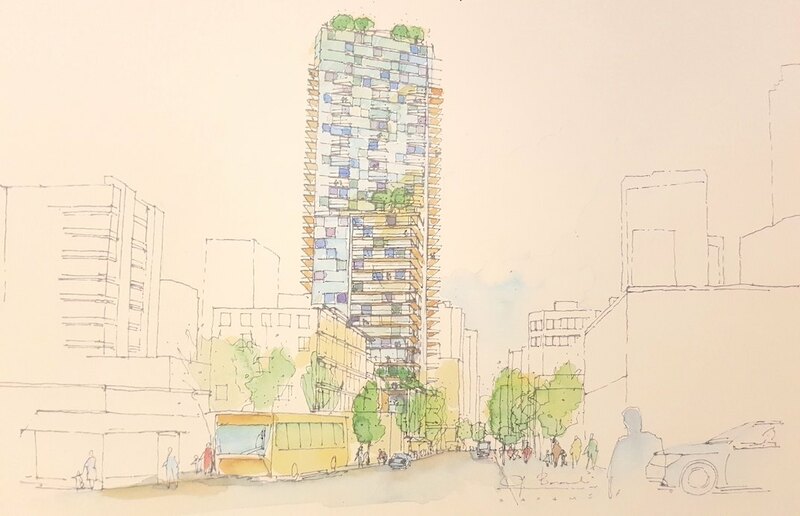 While sun shades are usually installed within the interior of the tower, inside the units, the sun shades for this proposal would place the shades on the exterior of the windows for a greater impact. This builds on his firm’s success with the usage of sun shades for a building they designed in the Olympic Village area. This project is currently in the pre-application phase; a formal rezoning application is expected later this year. 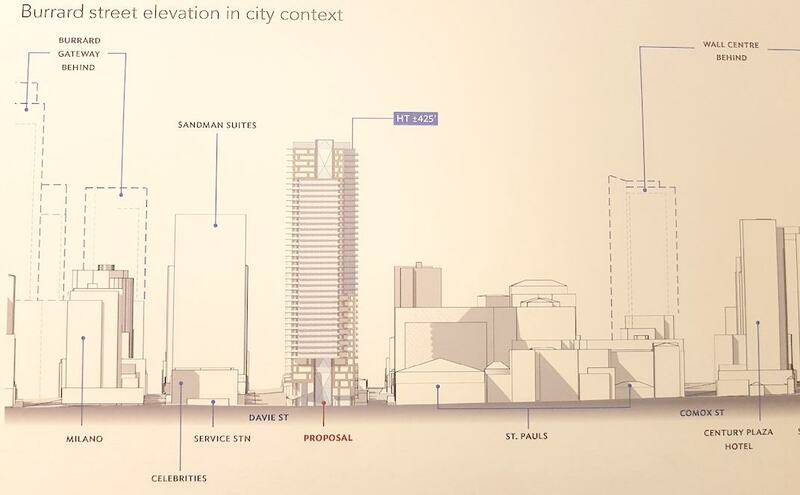 The height, scale, uses, and designs of the proposal are permitted under a number of City policies, including the West End Community Plan, Housing for Families with Children Guidelines, Rezoning Policy for Sustainable Large Developments, and Green Building Policy for Rezonings. 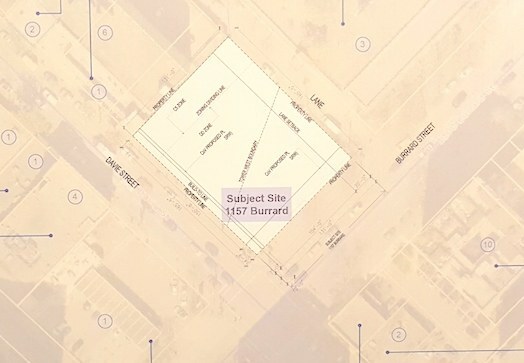 The development’s lot is within close proximity to a number of proposed and under-construction towers, including social housing and the new Qmunity space on the northeast corner of the same intersection, the multi-tower Burrard Place, and a quartz-shaped tower on the site of 7-Eleven. 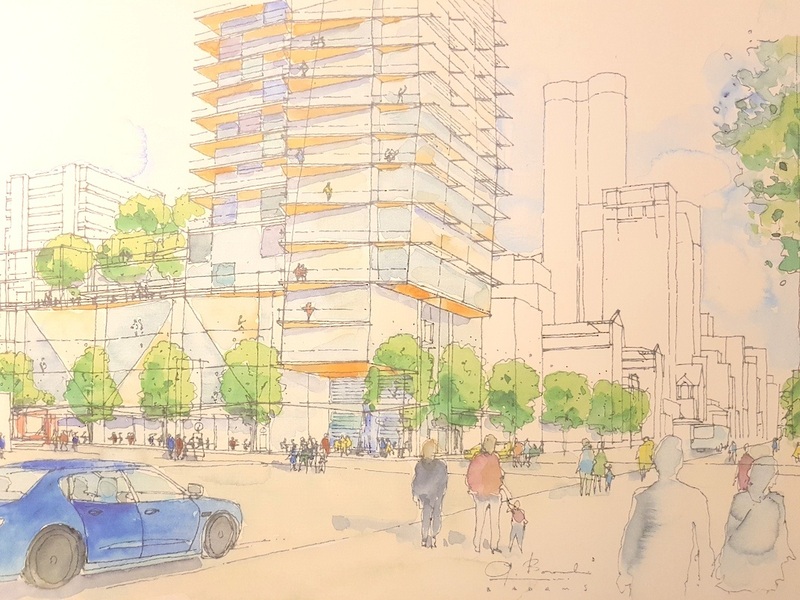 Over the longer term, it is expected the adjacent St. Paul’s Hospital site will undergo a major redevelopment to help fund the construction of the new hospital facility in the False Creek Flats.